We Welcome you in Faith!! 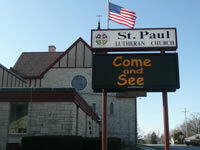 Welcome to our website and to the wonderful Christian community at St. Paul Lutheran Church of Postville, Iowa. We hope that you will take a few moments to explore our ministry and mission which are represented in these pages. We are excited about all that is happening in this place through the power of God’s Holy Spirit. We hope that you will visit with us soon. Our Saturday night worship is designed to be casual and comfortable, and is held in our Fellowship Hall. Our Sunday worship (both Traditional and New Traditions services) is designed to be inspiring, hope-filled, and fun. We will do our best to welcome you with love, joy, and friendship. We will do our best to help you feel right at home! If you have questions, concerns or problems, we truly believe that your answers can be found in Jesus. I would be delighted to speak with you by e-mail at stplprpost@neitel.net or by telephone at 563-864-7643.